Child Marriage in India is a matter of serious concern. Child Marriage denies a child the basic right to good health, nutrition and education. It is widely acknowledged that early marriage makes girls more vulnerable to violence, abuse and exploitation. For both girls and boys, marriage has a strong physical, intellectual, psychological and emotional impact, cutting off educational opportunities and chances of personal growth. While boys are also affected by child marriage, this is an issue that impacts upon girls in far larger numbers and with more intensity, so much so that nearly half of women age 18-29 (46 percent) and more than one-quarter of men age 21-29 (27 percent) are estimated to have married before reaching the legal minimum age at marriage (NFHS III). It is believed that the main reasons for early marriage are cultural factors, social practices and economic pressures interacting with poverty and inequality. 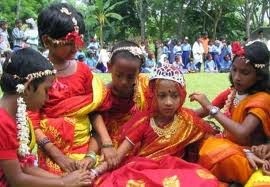 Thus, the issue of child marriage is steeped in several multi-dimensional social, economic, cultural and community related aspects. Legislation forbidding child marriage in pre-independent India was put in place in 1929. The child Marriage Restraint Act, 1929 primarily focussed on restraining the solemnization of child marriages. The Union Government has endeavoured to curb the practice in recent years through repealing Child Marriage Restraint Act of 1929 and bringing in a more progressive Prohibition of Child Marriage Act, 2006 that includes punitive measures against those who perform, permit and promote child marriage. Under this Act, child marriage is defined as the marriage of males below the age of 21 years, and females below 18 years. It also provides for annulment of a child marriage and gives a separated female the right to maintenance and residence from her husband if he is above 18 or in-laws if he is a minor until she is remarried. This Act came into effect in November 2007. The States are vested with powers to formulate rules for implementation of this legislation and carrying out the provisions. As per information provided by the States/UTs, so far 24 UTs/ States have framed rules and 20 States/UTs have appointed Child Marriage Prohibition Officers. The Central Government is regularly pursuing with the State Governments for appointment of Child Marriage Prohibition Officers and notification of state Rules. The National Plan of Action for children 2005 also includes goals on eradicating child marriage. One of the notable initiatives taken by India towards protection of children including the girl child has been the establishment of a National Commission for Protection of Child Rights in 2007 for proper enforcement of children’s rights and effective implementation of laws and programs relating to children. Several National level policies formulated since 2000, including the National Population Policy 2000,the National Youth Policy 2003 and the National Adolescent Reproductive and Sexual Health Strategy have advocated delaying the age at marriage and the age of conceiving the first child. • To promote sensitization and awareness on the girl child, the Government has declared January 24 of every year as ‘National Girl Child Day’. • Every year, State Governments are requested to take special initiative to delay marriage on AkhaTeej—the traditional day for such marriages, by coordinated efforts. • Workshops, seminars and legal awareness camps are organized to bring attitudinal changes to prevent child marriage. • SABLA, a Scheme for empowering adolescent girls, has been launched in 200 districts of the country from 19th November 2010. The Scheme aims at empowering adolescent girls (11-18 years) by improving their nutritional and health status and upgrading various skills like home skills, life skills and vocational skills etc. and building awareness on various issues. They would also be sensitized towards the importance marriage at the right age. By empowering adolescent girls, who can say no to early marriage, the Scheme would also address the issue of child marriage. • A National Consultation on Prevention of Child Marriage was organized on 25th May 2012 in New Delhi. The discussions in the consultation primarily centred on legislative and implementation aspects of Prohibition of Child Marriage Act (PCMA) 2006 and other related laws. It was agreed in the consultation that Information, Education and Communication (IEC) measures and advocacy particularly, after vulnerability mapping was the way forward for addressing social attitude that perpetrates child marriage. Convergence between various Central Departments and Ministries, and a coordinated inter-departmental action for effective implementation of the relevant schemes and programmes of the Centre and State Government on child marriage was also emphasized. • A National Strategy on Child Marriage prevention focusing on law enforcement, access to quality education and other opportunities, changing mind sets and social norms, empowerment of adolescents etc. was prepared in December 2012.
i) To enforce PCMA 2006 and related laws and policies to protect children and adolescents against child marriage and promote gender equality. ii) To promote the right to quality education at all levels with a special emphasis on girls. iii) To generate a change in social norms and attitudes regarding child marriage and the role and status of girls in society. iv) To empower and build capacities of adolescent boys and girls to access services and make informed decisions in matters affecting their lives. v) To generate knowledge and data to inform programmes and policies. vi) To develop and establish monitoring and evaluation systems to measure outcomes. vii) To enhance convergence across line Ministries, departments and other stakeholders. The draft Plan of Action was discussed in a Regional Consultation at Lucknow on 8th July 2013 and in a National Consultation at New Delhi on 18th July 2013.Based on the deliberations, the National Plan of Action is being finalized .The National Plan of Action defines goals, objectives, and strategies besides delineating roles of different stakeholder. It adopts strategic interventions which will be implemented by various stake holders viz. Central Government, State Governments, local self governments, Civil Society, and NGOs using convergent and multi-dimensional approaches.